If you find yourself looking at the weather forecast and fantasizing about fleeing winter for sun, sand and some serious R&R, then look no further. 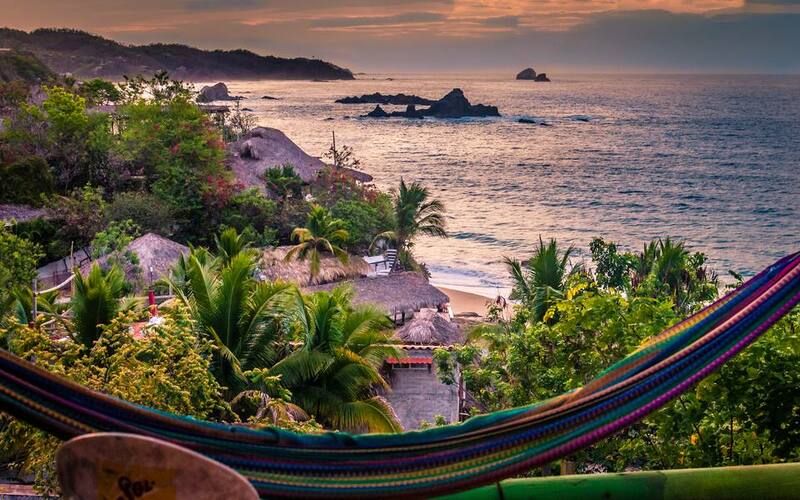 Here are 8 destinations in Mexico where you can escape the cold in style. The Draw: Spa, sun, and romance. The perfect trifecta for a memorable winter escape. Where to Stay and Eat: The Viceroy Riviera Maya offers 41 luxurious private villas set in a lush tropical jungle along a 7-mile stretch of beachfront. Rooms have canopied beds, hand-crocheted hammocks, and outdoor showers. Couples can choose to dine anywhere in the resort: beachside, poolside, in their villa, or at the ultra-romantic restaurant on a terrace overlooking the ocean. The spa draws on ancient Mayan healing rituals and treatments inspired by the ocean, along with unusual treatments like a lunar massage performed at the edge of the sea. Experts will thrill to the highs and lows of the legendary Zicatela pipeline, while beginners can get their groove on at Playa Carrizalillo, a more sheltered cove set fetchingly between the two rocky headlands. The beach has a small bar and several palapas on the sand. Book in for some lessons with the well-regarded Oasis Surf Academy, a professional, friendly outfit located at the top of the steps above the beach. Where to Stay: The reasonably priced and dramatically situated Villas Carrizalillo are strung along a cliff top and overlook a beautiful beach. Check rates. Where to Eat: Carmen’s Cafecito is a buzzy breakfast spot serving pastries, juices, and local specialties. The Draw: A decadent party scene. If you’re ready to let your hair down and check out some beautiful Pacific beaches, Cabo might be just the winter tonic you’re looking for. Visit El Arco, the monumental rock formation at the east end of town, and Lover’s Beach (Playa del Amor), a lovely stretch of unspoiled sand along the way. Where to Stay: There are a number of top hotels to discover, great for either partying or relaxing. Visit a luxury spa to kick your relaxation up a notch. The Draw: Family fun in the sun. This resort town on the Pacific Coast wraps around scenic Banderas Bay, with its dramatic Sierra Madre backdrop. Safe, friendly and bursting with family-friendly activities, Puerto Vallarta offers kids distractions like snorkeling, whale-watching and jungle adventures while keeping parents entertained with world-class restaurants, golf courses, and a thriving art scene. Where to Stay: The CasaMagna Marriott Puerto Vallarta Resort & Spa features a large swimming pool, beachfront and kid’s club. Where to Eat: All family-friendly hotels offer special kid’s meals but most of the city’s better restaurants, like Trio and River Café, are receptive to families as well. A growing interest in adventure tourism has encouraged conservation of this area’s fragile eco-system and fostered recognition of the importance of sustainable tourism. There's everything from snorkeling in cenotes and underground caves to zip-lining through the jungle or floating along clear lagoons in an inner tube. Where to Stay: Get back to nature in Tulum. Many beachfront hotels rely on solar and wind power, and some have sea turtle preservation programs. Where to Eat: Casa Banana, the restaurant of Hotel La Nueva Vida de Ramiro is a palapa-style space romantically lit with candles and lanterns. The menu is a melange of classic Mexican and a wood-fired Argentine-style grill. Mexico's premier diving spot is an island just off the Riviera Maya. For a laid-back vacation, stay on the island and go on diving and snorkeling excursions during the day and when the sun goes down, enjoy the island's low key nightlife. Where to Stay: Iberostar Cozumel combines the comforts of an all-inclusive resort with diving opportunities at your doorstep. Where to Eat: For delicious, fresh seafood in a casual beach-side environment, head to Alberto's Beach Bar. Or you can have wood-oven fired pizza and other Italian dishes at Guido's. The birthplace of tequila, mariachi music and Mexico's national sport, charrería, is in the state of Jalisco. You can visit the big city of Guadalajara, or enjoy the fabulous agave landscapes and discover the secrets behind the production of Mexico's most famous beverage in the small town of Tequila, which is located very close by. Where to Stay: Hotel Solar de las Animas, a boutique hotel with two heated pools, luxurious suites and wonderful views from the rooftop terrace. Where to Eat: La Fonda Cholula for traditional Mexican cuisine—a great place to taste some of the local dishes that Guadalajara is known for, such as tortas ahogadas. Where to Stay: Hotel Rancho San Cayetano, a rustic but beautiful lodge surrounded by nature. Playa Sonrisa clothing optional hotel. "All you need is your smile."